It is merely late May, but it wouldn’t be a stretch to think that at least a few Cincinnati Reds players and coaches (and fans) wish it were late September. The Reds have dropped 10 games in a row and lost 15 of their last 17. Rebuilding comes at you fast, I suppose. Count me in the camp that believe the tide will turn ever so slightly for the Reds over the next month or so. Manager Bryan Price noted recently that starters Anthony DeSclafani, Raisel Iglesias, and Michael Lorenzen could be back in June, with Homer Bailey’s return from Tommy John surgery a possibility in early July. That heavy helping of good news should bump the Reds from their present 110-loss pace. But as the calendar creeps toward July, shopping season will begin in earnest for baseball’s contenders, which means Jay Bruce, Zack Cozart, and to a lesser extent, Brandon Phillips, will find themselves squarely in MLB’s rumor mill. The Reds’ front office is not budging from its rebuilding mantra, and the finishing touches on the teardown will be complete once that trio is no longer rocking the red and white. Statistics primer: slash=batting average/on-base percentage/slugging percentage; wRC+=total offensive value/run creation where 100 is league average; fWAR=FanGraphs’s measure of Wins Above Replacement. The first thing to remember about Bruce is that the Reds’ right-fielder can block a trade to the Athletics, Diamondbacks, Indians, Marlins, Rays, Red Sox, Twins, and Yankees. As for his on-field performance, Bruce is enjoying a strong 2016 at the dish, despite not doing much to rectify the ground-ball and plate discipline issues that plagued him in 2014 and 2015. The Royals have been scraping by offensively with their platoon of Jarrod Dyson and Paulo Orlando, and the position could use an infusion of power, as the Royals’ right fielders have clubbed just one home run all season. Factor in that left fielder Alex Gordon will likely miss at least the next month with a fractured wrist and that the entire Kansas City offense—which ranks 19th in the majors in run creation and 26th in raw power—is in need of a power surge. Bruce’s defense (minus-10 Defensive Runs Saved) has been far below his typical standards this season, but the Royals may be forced to accept an offense-for-defense trade-off. Bruce would have to approve a trade to Cleveland, and the Reds would also likely be stuck with some of the bill. The Indians—who are just a half-game out of first in the American League Central—are trotting out a substandard outfield of Jose Ramirez, Rajai Davis, and Marlon Byrd/Lonnie Chisenhall. Michael Brantley, Cleveland’s All-Star left fielder, is on the shelf indefinitely with recurring shoulder issues, and the pitching-rich Tribe cannot afford to have their lackluster offense cost them a possible postseason berth. Had they been lacking organizational depth, the Rangers may have found themselves higher on this list. Three former Reds outfielders recently hit the disabled list for Texas: Shin-Soo Choo has a hamstring injury that will keep the right-fielder out for a few weeks at minimum, Drew Stubbs has a toe issue, and Josh Hamilton needs knee surgery and is out for the year. And yet, Choo and Stubbs should be back sooner rather than later. Ian Desmond, a converted shortstop, has been a pleasant surprise, and recalled top prospect Joey Gallo should fair better in his second go-around in the majors. Delino DeShields Jr., who was a revelation as rookie in 2015 but has so far slumped as a sophomore, is also just a call away at Triple-A. (Potentially) reunited and it feels so good! 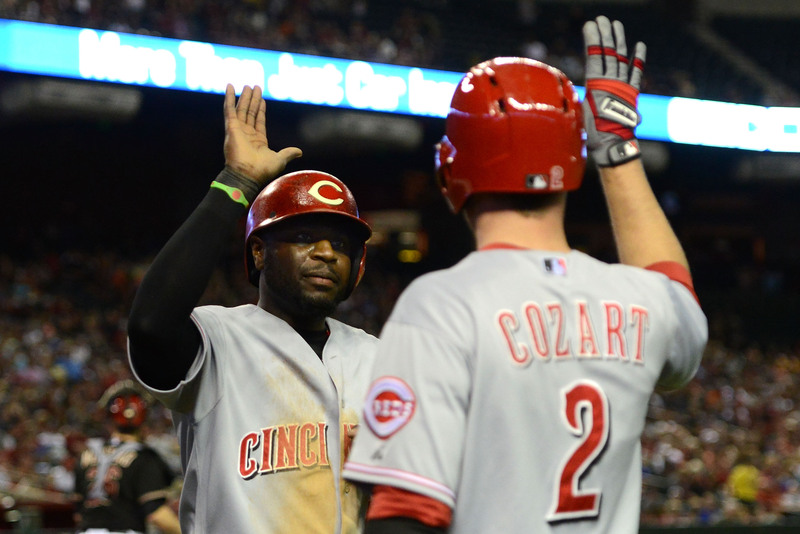 The White Sox trading for Cozart would pair the Reds shortstop with former Cincinnati third baseman Todd Frazier, who was shipped to the South Side in December. Jimmy Rollins has primarily handled shortstop for Chicago this season, and it’s been a struggle for the ex-Phillies great in the field (minus-1 Defensive Runs Saved) and at the plate (.289 on-base percentage, 72 wRC+). Meanwhile, Cozart has put any fears to rest about the stability of his surgically-repaired right knee by flashing his typically sterling work with the glove (6 Defensive Runs Saved) and by enjoying a career year offensively. The White Sox’s top prospect is shortstop Tim Anderson, but the 22-year-old is only in his first season in Triple-A ball. Anderson’s batting average (.309) and on-base percentage (.335) look great, but he strikes out in over 23 percent of his at bats, has walked only seven times in 186 plate appearances, and has 85 errors in 294 career minor league games. Trading for Cozart, who has one more year of arbitration to go through in 2017 before he becomes a free agent at age 32, would be pushing back the start of the Anderson Era, but the White Sox, on the strength of their pitching, find themselves clinging to the AL Central lead. The Royals are vulnerable, and the Indians don’t harbor the same financial wherewithal that Chicago does to make improvements. Another option for Cozart is the Diamondbacks, provided Arizona—which is already 8.5 games behind the Giants in the NL West—is willing to end or pause the Nick Ahmed experiment. Ahmed’s glove (29 Defensive Runs Saved in 203 games) is outstanding but his bat (.219/.268/.339 career slash) is nonexistent. Phillips is really struggling at the plate in 2016, and his defense (minus-1 Defensive Runs Saved) has not been what Reds fans are used to from the soon-to-be 35-year-old—which is exactly why the Reds attempted to trade Phillips to the Diamondbacks and the Nationals during the offseason. Phillips, who has trade veto rights as a result of spending 10 years in the majors and the last five seasons with the same team, exercised his right to block a trade on both occasions. Since no sane team will absorb Phillips’ full salary, the Reds would have to pay a large cut of Phillips’ remaining contract in order to move their longtime second baseman. Phillips, who is making $13 million this season, would also have to back off his demands for additional cash (which stalled the Diamondbacks and Nationals trades) in exchange for waiving his no-trade clause. Given those restrictions, moving Phillips is a difficult (but not impossible) enterprise. The Blue Jays would probably prefer to be able to do better than a Ryan Goins-Darwin Barney timeshare at second base. Omar Infante continues to start at second for the Royals despite failing to record an on-base percentage over .300 since 2013. A more likely scenario is Phillips coming to his senses and realizing that he does not want to spend his remaining days as a semi-useful starter on the sinking ship that is the Reds and either agrees to a trade this offseason or by the 2017 trade deadline when the financial hit for both the Reds and the team receiving Phillips is dulled.